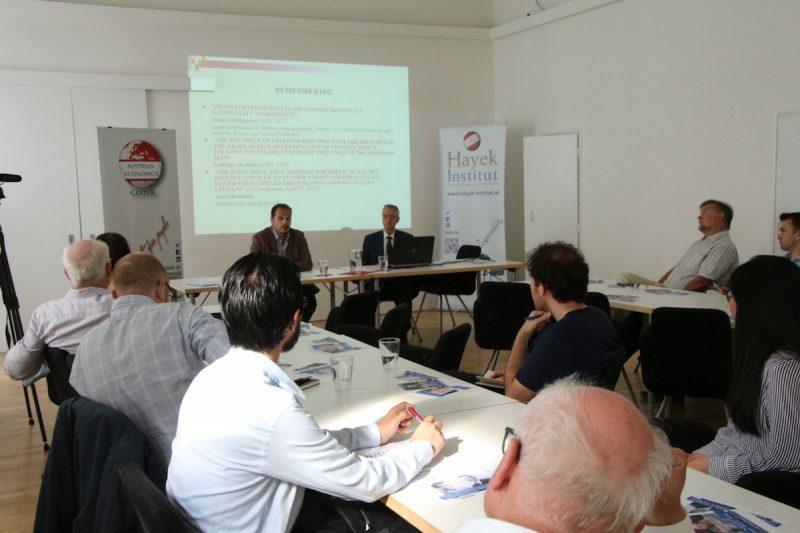 On Tuesday, May 29, Dr. Carlos Puente gave a lecture at the Hayek Saal on the consequences for Spain and for the European Union of a possible secession of Catalonia. The event was moderated by Federico Fernández, who offered some reflections as an introduction. The presentation was divided into four thematic axes: the social, economic, historical and political context of Catalonia, with a brief mention about „pancatalanism;“ the legal framework of Catalan autonomy; the arguments of nationalism in favor of independence; and the consequences of separatism for Spain and Europe. Finally, the conclusions were presented. The speaker mentioned that Catalan nationalism has falsified history, looking for an external enemy to spread paranoia among the population. Therefore, according to him, it’s important to know the real context of Catalonia. Catalonia is one of the seventeen territorial entities in which Spain is divided and consists of four provinces. Some distinctive features of its society are: the Mediterranean influence, a culture of saving and hard work, a strong commercial vocation (an autochthonous banking industry never developed), and a historic revolutionary anarchist tradition. In his historical account, the speaker emphasized that Spain was the first unified nation-state in Europe, which resulted from the union between the Crown of Aragon and the Crown of Castile in 1479. During this time, Catalonia was a political subject of the Crown of Aragon, with its own institutions and customs. In 1640, a war conflict arose between Catalonia and the Hispanic Monarchy, which was resolved twelve years later with the latter’s victory. One of the most important events in the history of Catalonia was the War of the Spanish Succession (1701-1714) between the Habsburgs and the Bourbons for the Spanish throne. The latter took the victory and once in power,established a centralized state, ending the political privileges enjoyed by Catalonia. Puente emphasized that this was not quite as bad, because the central state granted economic and commercial privileges to Catalans, which were key to achieving the level of economic prosperity enjoyed by them to this day. For instance, Cuba, Puerto Rico and the Philippines were converted into an exclusive market for Catalan exports during the 19th century, and the Catalan industry benefited from Madrid’s protectionism. In the 20th century, the preferential treatment towards Catalonia continued. At the time of Franco’s regime, the region received a huge number of subsidies and privileges for the location of new industries. With the arrival of democracy in 1975, Catalonia received large investments that allowed its industry to compete in the EEC. By way of summary, the speaker highlighted that Catalans have not lost any freedom in all this time, the economic prosperity begins with the arrival of the Bourbons to the throne, the nineteenth-century boom was based primarily on commercial privileges and that Catalan companies have benefited at the expense of consumers in the rest of Spain. Subsequently, the legal framework of modern Catalan autonomy was presented: the 1978 Constitution and the Statute of Autonomy. The former was endorsed by 92% of Catalan voters and endowed the region with a broad degree of self-government, giving it exclusive management over its economic affairs, its own police force and broad competencies in healthcare, media, and education. The latter was enacted in 2006 – however, the first Statute of Autonomy dates to 1979 – but had to be modified due to some objections presented by the Spanish judicial power, which reignited the pro-independence discourse. Then, the arguments presented by Catalan nationalism in favor of independence were addressed, among which stand out: the oppression that Spain has exercised over the Catalan people throughout its history, particularly manifested in the Bourbonic centralization and Franco’s dictatorship. The speaker clarified that these are not sufficient arguments, because the rest of Spain also suffered under these conditions. It was also mentioned that Catalonia, presumably, must maintain the rest of the autonomous communities, which is questionable, given that the region has a high fiscal deficit. Dr. Puente pointed out the consequences of secessionism for Spain: breach of social coexistence, economic impoverishment, internal market rupture, barriers to the free movement of goods and capital, fall in GDP (both in Catalonia and in the rest of Spain), increase in production costs and relocation of industries and businesses. At the European level, the four freedoms (goods, services, people and capitals) would be seriously affected if Catalonia were not a member state. The European industries based in Catalonia would have to relocate, as well as the agencies of the European Union; there would be changes in industrial cooperation, in the prices of some products, and in the management of air and maritime transport. In conclusion, the speaker offered some recommendations for both the Spanish central government and the Catalan autonomous government. He recommended to Spanish authorities to respect the results of the last Catalan elections (21 December 2017), recognize the specific rights of Catalonia, the Basque Country and Galicia, and establish a dialogue with the Catalan government. Also, he suggested to separatists to respect the rights of opposition and avoid the adoption of laws that violate the Constitution and the Statute of Autonomy. Finally, Dr. Puente warned that populism and the Catalan bourgeoisie are behind the separatist process, that individual liberties are at risk in Catalonia, that independence is an excuse to hide corruption, that pancatalanism – the idea of bringing together a single political entity to different regions of Spain, France and Italy where Catalan culture is present – is incompatible with national and individual rights in a global world, and that businesses need legal stability to be able to function, which has been broken for separatism. David Chávez Salazar ist ein Praktikant beim Austrian Economics Center. Er hat einen Bachelor of Science in der Ökonomie.